Purchasing a crib and mattress (we also review the best crib mattresses) is a big investment for your family, and you want to make sure the one you choose is safe, reliable, versatile, comfortable, and convenient. You also want it to be convertible, which means it will transition to support your baby, toddler, big kid, and even tween and beyond! To find the best and safest baby cribs of 2019, our hands-on reviews pulled together 13 popular baby cribs and put them to the test. The top 5 cribs are listed below, followed by in-depth reviews of about 10 different cribs. Finding the perfect crib can be tough, especially with over 500 different cribs available on the market! You want it to be cute and match the style of the nursery furniture (like the nursery glider), conform with all current safety standards, be versatile and transition easily to a toddler bed, and be comfortable, well-built, affordable, and easy to assemble. For details about how we evaluated each of these factors, see the bottom of this article and check out our full crib buying guide. Here are the Best Cribs of 2019! 1. Babyletto Hudson 3-in-1 Convertible Crib. The babyletto line is gaining popularity over the past 5 years, with very well-built cribs that look great, are easy to assemble, have great features, and don't completely break the bank. They are for the stylish parents who don't want to compromise on design or safety and are willing to pay about $100 more than a typical (and less stylish!) crib. We first became aware of the babyletto line of cribs when over the years our visitors kept emailing us about how happy they were with their new babyletto cribs. That's a great sign when people are willing to go out of their way to send us emails, so last year we got our hands on one and we were not disappointed. The Hudson 3in1 convertible crib is no exception to the popularity of the babyletto series, it's an awesome baby crib that converts from a full crib, to a toddler crib (with an included rail), to a daybed. The only thing it does not do is convert all the way up to a twin or full-size bed frame, which in our opinion is a feature that the vast majority of parents never end up using. This crib uses an awesome mid-century modern design with squared corners and rounded spindles, making it look sleek, simple, and modern. Assembly took about 30 minutes, which is about normal, and the included instructions were very clear. You attach the feet, then 3 sides, then the mattress spring, and then the front side. It comes with an Allen wrench, but you will also need a Philips head (cross-head) screwdriver. There were 4 mattress heights on our unit, which gives it nice versatility. The assembled crib is very sturdy and heavy, no worries about it creaking and flexing with a bouncy toddler! It has a weight limit of 50 pounds for the toddler bed, which means you'll make it until about 4-5 years old before out-growing it either in weight or height. So beyond the excellent functionality of this crib, there are some additional aspects to feel great about. The crib is Greenguard Gold Certified, which means it is tested to ensure it has very low chemical emissions. Made with sustainably sourced New Zealand pine, this crib is free of lead, phthalates (e.g., BPA), and over 360 other volatile organic compounds (VOCs) and over 10,000 other chemicals. It also far surpasses several CPSIA, CFR, and ASTM requirements for build quality (spindle load support), and chemical and heavy metal content. And if that's not enough to make you feel good, it also comes in several visually appealing colors, including grey (pictured), white, slate, espresso, natural pine, and some two-tone varieties. By the way, the top-rated Babyletto Pure crib mattress fits this crib *perfectly*. Overall, this is a truly excellent crib. The only downfall is the price, which tends to be a bit more than most other cribs on this list. In our opinion, it's worth it for the peace of mind regarding safety and sustainable sourcing. Interested? You can check out the Babyletto Hudson here. 2. DaVinci Kalani 4-in-1 Convertible Crib. This Davinci Kalani 4in1 convertible crib has been around for several years now and has changed quite a bit along the way. It is an awesome choice for someone looking for high versatility and safety, may not be looking for the mid-century modern look, or isn't willing to pay the price premium for the top-rated babyletto crib. It is an awesome, handsome crib made by a company with a great reputation for quality, safety, and convenience. This crib has it all: Greenguard Certification for lead, phthalates, and emissions, 4 mattress height adjustment levels, a low profile to help you reach in and out, and it surpasses all current safety standards. It also uses New Zealand pine sourced from sustainable forests, which makes you feel good about your purchase. This crib has won several awards for its great features and quality, including from BabyCenter, National Parenting Publications, and Babble. It comes in several finishes including Cherry, Espresso, Black/Ebony, White, and Chestnut. It converts from an infant crib, to a toddler bed with a rail, to a daybed without the rail, all the way to a full-size bed (but of course you will have to buy the full-size mattress and frame). This is a great convertible crib, but it also has some downfalls relative to the higher options on this list. First, we tested out the white version and didn't like that the dark-colored screws stood out so much visually. Second, DaVinci used to include the toddler rail with this crib but recently stopped including it, even though they have not lowered their prices any. Finally, we found that during assembly it was a little too easy to scratch the thin finish on the wood. Overall, this is a reasonably priced crib option with really excellent features, but you will need to get your own toddler rail and the build quality isn't as great as it used to be. Usually sells for about $220-250 online. Interested? You can check out the DaVinci Kalani here. 3. Delta Children Bentley 4-in-1 Convertible Crib. This 4-in-1 convertible baby crib is one of several cribs made by Delta Children that all pack some serious bang for the buck, great styling, and sturdy build quality. These include not only the Bentley, but also the Emery, Canton, and Heartland models. We got our hands on the Bentley for testing in mid-2019, and were impressed with its versatility, quality, ease of use, and sleigh crib style. It's one of only a few solid wood cribs that are available for under $300. The one we tested was made of solid cherry wood that was heavy and good quality: ours didn't have any dings, blemishes, touch-up paint, or cracks. Out of the box, assembly was surprisingly easy and took us about 20 minutes with the included tools. Note a few things: first, expect some expansion and contraction of solid wood so that screw holes might not line up perfectly. Consider assembling it with loose screws throughout, and then once all the screws are in, you can tighten them down. Second, do not over-tighten the screws, or you might run into trouble with the hardware or cracking wood. Once it is assembled, it has some great features. It has a 3-position mattress height, several layers of lead-free stain for durability, and there is a matching nursery dresser if you're interested (see it here). We found the metal frame springs to be strong, the dimensions to perfectly fit two test mattresses (the Safety 1st Heavenly Dreams, and Newton Wovenaire), and the entire thing to be very sturdy and strong. The highest mattress setting was high enough for us to comfortably reach inside to lift a baby, and the lowest was low enough to prevent climbing in young toddlers. While it does not include a toddler bar or conversion kit to turn it into a full-size bed, it does have the capability to achieve 4 functions: crib, toddler bed, daybed, and full size bed. You can find the toddler bar and full size bed conversion kit pretty easily online, and they are reasonably priced. So overall we really appreciated this crib, and think it makes a great addition to our best cribs list (and be sure to check out the Delta Children Emery, Canton, and Heartland models as well)! Cons? Well, there are only 3 height adjustments rather than 4 (but that's not a big deal), it is not GreenGuard Certified, we have no idea how they source their wood, and some of the hardware is not the best quality. 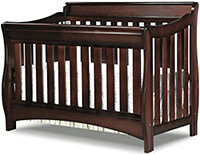 This crib usually sells for about $260 online, and is available in Black Cherry (pictured), Chocolate, and White. Interested? You can check out the Bentley 4-in-1 Convertible Crib here. 4. Stork Craft Tuscany 4-in-1 Convertible Crib. This 4in1 convertible crib has a beautiful traditional styling, and we think it looks fantastic in espresso, grey, and white. It is a great crib made by a company (Stork Craft) with an excellent reputation for build quality and customer service. This crib has several great features: solid pine and composite construction, meets or exceeds government safety standards for construction and finishes (ASTM, CPSC, and JPMA), has 3 mattress height adjustment levels, a low profile to help you get your baby in and out, a separately-purchased toddler rail for easy conversion, and a long reputation for great build quality. This crib converts from an infant crib to a toddler bed (you need to purchase the toddler rail separately here), then into a daybed (front and rail removed), and finally into a full-size bed using the back and front as headboard and footboard (but the metal bed frame is sold separately). It comes in several finishes, including Cherry, White, Brown, Espresso, and Gray. The gray is a nice soft-looking modern gray finish. 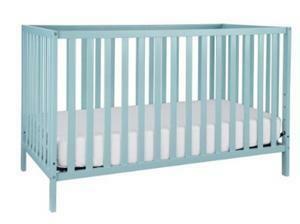 In our testing, we thought it assembled easily, and was sturdy, stylish, and overall good quality, especially for a $235 crib. Cons? Well, it has only 3 rather than 4 height adjustment settings, which may or may not affect you at all; it simply means there is more space between the settings. Realistically, you'll likely only use 2 or 3, because once they start standing you'll want it nice and low! It also does not include the toddler rail, or hold GreenGuard Certification for finish quality and emissions, or use wood from sustainable forests, so if you're into those things you should definitely check out the others on this list. Overall, this is a great and competitively priced crib and you can't really go wrong with it. Note that there is also a matching changing table available as well. Usually sells for about $250 online. Interested? You can check out the Stork Craft Tuscany here. 5. 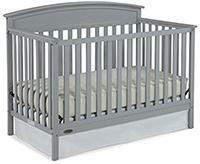 Graco Benton 4-in-1 Convertible Crib. This is an excellent bang-for-the-buck crib, with high levels of versatility, good quality, for an excellent price around $120-130. 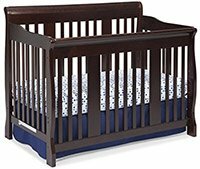 This solid wood crib meets several government standards, including those of ASTM and CPSC, and is JPMA certified. It uses solid pine wood sourced from New Zealand, along with some veneer. This Graco Benton 4in1 convertible crib is of high build quality, and in our testing, the assembly took only about 15 minutes with a cordless drill/driver. Mattresses fit very well into the corners, and reaching in and out of the crib was easy even for shorter moms. The styling is simple, with some farmhouse styling with its colors and curves. The mattress adjusts among 3 height positions, like the Stork Craft. It converts to a toddler bed, which basically means removing the front and positioning the mattress on the lowest setting and attaching a toddler rail (sold separately). Then a daybed, which means positioning the mattress higher, and then a full-size bed with (not provided) frame rails. For the toddler bed, it does not include a toddler rail, so you will need to purchase one of the universal ones. Not surprising given the low price of this crib, so you'll still be saving quite a bit relative to the above options, even with having to purchase a universal toddler rail. Overall, we found this to be sturdy, decently constructed, and reliable. Usually sells online for about $120. Interested? You can check out the Graco Benton here. 6. DaVinci Jenny Lind Convertible Crib. This high-quality convertible crib uses the popular spindle style slats, bringing back nostalgia from the cribs of yesteryear! Parents tend to either love or hate this style, so it's solely a matter of personal preference. If you like the style, you're getting an excellent 3in1 convertible crib, though not quite as versatile as the 4-in-1 options above. This is another DaVinci crib, with one of the most solid reputations in the crib industry. This crib has Greenguard Certification for lead, phthalates, and chemical emissions, it also has 4-level mattress height adjustment, a medium-height profile to make things not too difficult for getting your baby in and out (for lower profile, don't attach the included wheels), and it includes the toddler rail for converting to a toddler bed. Like the DaVinci Kalani it is made with solid wood sourced from sustainable forests. It has also won several awards, including from BabyCenter, Baby Bargains, and National Parenting Publications, so it has a great following and reputation. It comes in several color options including White, Cherry, Ebony, and adorable baby blue Lagoon and yellow Sunshine. It converts from an infant crib to a toddler bed with an included toddler rail, and then to a daybed if you remove that rail. It does not have the capability to convert to a full-size bed (thus the "3-in-1" rather than "4-in-1"). Cons? Well, like we just said, it's not a 4-in-1, so that's a bit limiting for some parents. Usually sells online for about $250. Interested? You can check out the DaVinci Jenny Lind here. 7. Union 2-in-1 Convertible Crib. 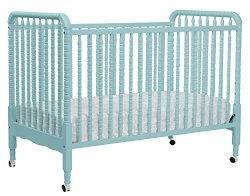 This is a relatively basic, no frills crib that still has a great build quality and a solid reputation for safety and reliability. This crib is relatively lightweight, easy to assemble, and complements a minimalist nursery style. The crib is made with sustainable solid New Zealand pine wood and uses a non-toxic finish that is lead and phthalate free. Like the best on this list, it has 4 adjustable mattress heights, accommodating a wide range of baby height and mobility. When we assembled it, it only took about 20 minutes using a battery powered screwdriver. We found that at first it was a bit wobbly but we tightened down the bolts and it became much sturdier. It has a low-profile height to make it easy to put the baby in and out. But it's important to note that it doesn't include the rail to convert to a toddler bed, which surprised us when we received it. You can either buy their recommended DaVinci toddler rail (which we thought was way too small), or you can buy a better universal toddler conversion kit for only about $20. This crib comes in several great colors, including traditional White, baby blue "Lagoon," cute yellow "Sunshine," Espresso, and light Gray. Cons? Well, it doesn't come with the toddler conversion rail which is unfortunate, and some customers report that it's not as sturdy as they'd like (but see our note above about assembly). Overall, this is a great, no-frills option that is also the least expensive on our list. We found it online for about $110-130. 8. 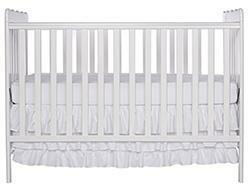 Dream on Me Classic Convertible Crib. This is a classically styled crib with some great features and a price point that's usually under $100. There's a lot to like about this 3in1 convertible crib. First, the wood is high-quality solid pine wood and stain that is free of BPA (phthalates), lead, and latex. Second, it has 3 mattress height positions for versatility and safety when your baby begins to roll, crawl, and pull up to stand. It is available in white, cherry, natural, black, and espresso colors, and we love the simplicity of the classic design. It's a no-frills crib, and it fits well into a minimalist nursery style. Third, it is a 3-in-1, allowing you to convert from a crib to a toddler bed with a rail (not included, but sold here), and then you remove the rail to make it a "daybed." In our testing, we found assembly to take about 30 minutes (with two adults), and we thought the overall build quality was quite high, especially for a crib at this price point. The wood and attachments felt solid, and even with that the entire crib only weighed about 35 pounds. Cons? Well, it doesn't include the toddler rail, which brings the price up a bit when that time comes. And we suggest buying the rail now rather than waiting since it's difficult to predict whether the compatible rail will be available in the future. It also only has 3 mattress positions, while we generally prefer 4 for added versatility. We also don't see any GreenGuard Certifications for materials or finishes, and no information about sourcing materials from sustainable sources. Of course, those things are basically impossible to find at this price point. Overall, this is an excellent, no-frills crib for simplicity and functionality. Definitely recommended for the budget conscious crib buyers! Safety. Here at Mommyhood101 we take safety very seriously. And cribs have come a long way with regard to safety. Many cribs used to feature a drop-down side to help parents reach their baby: these were banned for good reason in 2011. We won't get into why they were banned here, but suffice to say you should never purchase a drop-side crib online or at a yard sale! Older cribs can also have an unsafe gap width between slats. Current standards call for 2-3/8" (2.375") maximum distance between slats, but older cribs have wider gaps leading to little heads getting stuck between slats. Some cribs also have decorative cut-outs, maybe of a cute animal or character, but these should also be avoided as there is a risk of getting a little arm or leg caught. Finally, never get a crib with decorative rail posts that stick up on the corners; these are a snag hazard and need to be avoided. Fortunately, cribs have come a long way, but so have parents' needs: fast forward and there are many new safety criteria we're all looking for. First, Greenguard or other certification for lead, phthalates (BPA), and other chemical emissions. 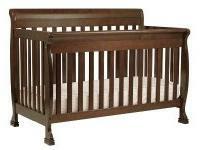 Second, you want the crib to be strong with high slat load strength, good stability, and low frame flex. Third, you want to make sure the company does not have a bad recall history and customer ratings for things like lead paint use (like this one), and ensure that it does not have any recent recalls. Finally, you want to make sure you get a mattress (usually sold separately) that is high quality with squared corners (see our best crib mattress reviews here). As you can see there are a lot of safety considerations when selecting that perfect crib for your baby. Don't worry, we did the work for you. Our best crib list only includes cribs that meet these stringent safety criteria. We don't want to freak you out, but here are some of the most common questions we get about bedding basics for a crib, with one consistent answer: NO! Are crib bumpers safe? Are pillows safe? How about decorative pillows? Are thick blankets safe? Are sleep positioners safe? No, no, no, no, and no! They are all unsafe due to suffocation risks: see here and here for details. Kids bedding is different, but for babies, you need to be really careful, and to be safe you need to keep other baby gear out of the crib. Comfort & Convenience. There are a few things to look for here. Now that there are no drop sides, you want to make sure the mattress height is adjustable between at least 3 levels. Like we said above, you want to start a newborn baby at the highest level and then move it down as your baby becomes more mobile and there's a risk of crawling/standing/climbing. Second, you want to pick the right mattress for comfort and safety. We review and rank the best crib mattresses here, but to summarize you want one without harmful emissions, with even and firm support, with squared-off corners, and with dual firmness. If you get a good quality mattress, it will fit snugly into the crib and provide many years of comfortable and safe sleep. You also want the crib to be low profile, without really tall legs that make it difficult for you to reach in and out. Finally, for convenience, you want a crib that doesn't take 5 hours to assemble! You basically only want it to have the 4 walls and mattress support. You attach the 4 sides together then put on the mattress support. If it's more complicated than that, then it's worth paying a lot more at a specialty store and having them assemble it for you. Most parents buy cribs online nowadays and report assembly taking about a half hour to an hour. Modern cribs include not only the instructions and parts but also all necessary tools. All of our best cribs are easy to assemble. If you're looking for a travel crib that's super portable, check out our reviews of the best travel cribs. Cost. We want to point out that most parents want to spend under about $350 on a crib, though you can certainly go much higher than that for premium cribs. Some top cribs go above $1000, upwards of $3000 in some cases. Those include cribs by companies such as AFK Furniture, Corsican, Bratt Decor, Newport Cottages and Natart Juvenile. In general, you will tend to get higher-end stylings, hand-crafted parts using traditional carpentry and wood joining techniques, made in the USA or Canada, and maybe even white-glove service. But remember you're only using the crib for a few years, and all of the cribs on our list meet ASTM and CPSC guidelines for safety, and many of them meet additional emissions and quality standards. And you might have some gift cards or coupons that you can pull together to make the price more tolerable! We've put together our list of cribs based on three assumptions that we've gathered from our website readers: First, most new parents want to spend under about $350 for a crib, and realize that paying more than that often doesn't result in tangible differences in safety or features. Second, most new parents want their crib to be functional and stylish, and style is a subjective preference that is unique to every parent. And third, people looking for higher-end cribs will likely already know certain companies and models based on experiences of their friends and families. Of course, there are also several places to buy a crib with a moderate to high price and superior quality. These include Pottery Barn furniture (PotteryBarn Baby), Crate and Kids, and others. These tend to be very high quality products at a price point that is quite a bit more than what you'll find on Amazon or Target, but lower than some of the very high end crib manufacturers that we list above (like Newport Cottages and others). At the lower end of the price range, if you're looking for a crib with modern styling at a reasonable price, we encourage you to consider an Ikea crib. There are several great Ikea cribs and Ikea toddler beds available. They tend to require more assembly than others and might not be quite as sturdy as the cribs on this list, but they are definitely great bang for the buck if you like the contemporary crib style.